I guess everyone has had a bucket list at one time or another. As one proceeds through geezerhood a bucket list begins to have higher priority because probably there is less time to check off items. I don't put much store in bucket lists. For the most part I have been able to see the things in the world that I really yearned to see and have done adventurous things when the opportunity has arisen. Therefore, I like living in the moment and being surprised when new opportunities come by chance. However, there have been things that I have really wanted to experience. Probably over 10 years ago I had wanted to see a live show of the Prairie Home Companion with Garrison Keillor. That wish was granted when he appeared at Bailey Hall on the Cornell University campus. Unfortunately daughter Victoria and I were seated almost behind a column that seriously restricted our view. We enjoyed the show but we certainly would have been more comfortable with better seating. Since that time in the last few years I have enjoyed three more mid April live performances of the Prairie Home Companion show at Town Hall on 43rd Street in New York City with daughter Victoria. Because my birthday comes in mid-April these shows are now becoming a celebratory tradition. It was a grand show this past Saturday and we had wonderful seats with an unobstructed view. 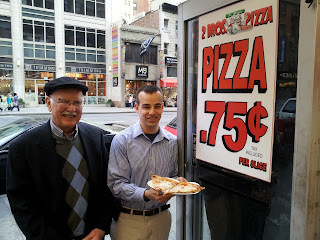 Leading up to the show we toured Bryant Park and enjoyed 75 cent a slice pizza (tax included). 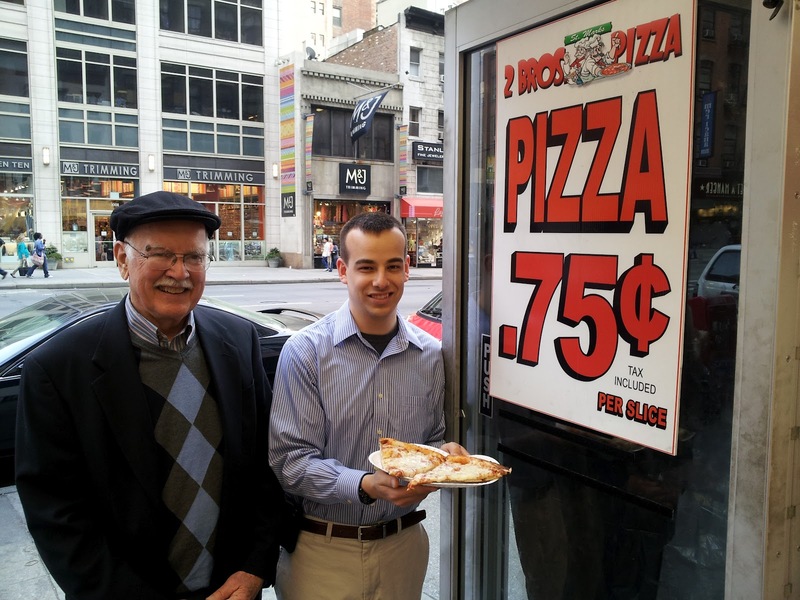 Imagine that in New York City! We even have photo proof. Walking the Brooklyn Bridge was also a part of our weekend adventure. I guess you could call that a bucket list activity too. As an engineer, it is almost a must to have actually visited this engineering marvel since this is the first steel-wire suspension bridge in the world. The bridge was undergoing some repairs as one might expect for a 129 year old structure. I guess you could call it a geezer bridge. Wikipedia summarizes its importance as follows. "The Brooklyn Bridge is one of the oldest suspension bridges in the United States. Completed in 1883, it connects the New York City boroughs of Manhattan and Brooklyn by spanning theEast River. With a main span of 1,595.5 feet (486.3 m), it was the longest suspension bridge in the world from its opening until 1903, and the first steel-wire suspension bridge." Our entire weekend was full of adventure and fun and even included for Nancy and I a Seder at our daughter's in-laws home. No need for bucket lists. New adventures and experiences come spontaneously.